The election fever is gripping the Nation or so we are made to believe…. Narendra Modi is travelling and is drawing huge crowds everywhere… even in places like Tamil Nadu where BJP’s presence is not so formidable…. I am a staunch supporter of Na Mo .. this is no post on my support but on the sad killings of yesterday and more of the way newspapers reported of the blasts… sure, one would not like unnecessarily alarming details and pictures ghastly describing the blood but……….still there has to be a way ….. Here is how The Hindu reported it : ‘ In a an apparent defusing bid, some people threw stones at bombs found at the venue of BJP leader Narendra Modi’s rally at the Gandhi Maidan here on Sunday. According to the police, five blasts took place between 11.40 a.m. and 12.25 p.m., triggering panic among the people in parts of the Maidan. However, given its huge size, people did not rush out of the venue in fear or confusion. “It was a yellow bomb fixed with a watch near one of the gates. Some kids were pelting stones at it and it exploded around 1 p.m. Mr. Modi had not yet started to speak. When the explosion took place, I had a blackout,” Ajit Pandey, who sustained a head injury, told The Hindu at the Patna Medical College and Hospital (PMCH), where 83 injured people were rushed. Most of them were either BJP workers or supporters at the rally. He said the police did not clear the people when the explosive was spotted. “People tried to defuse the bombs by throwing stones at them,” said Brijesh Kumar Mishra, who also suffered injuries. 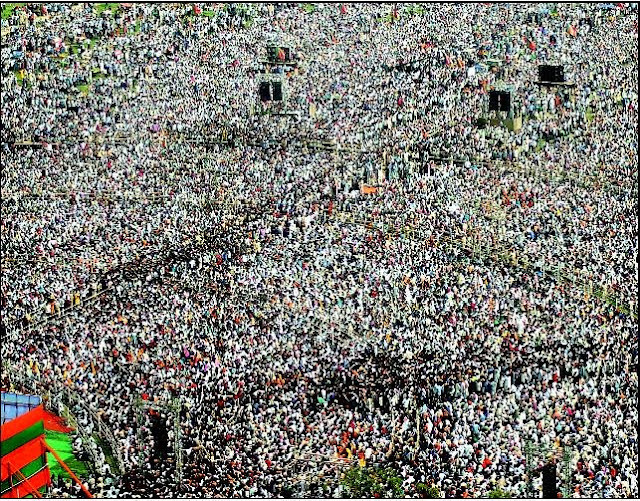 For the eager and unsuspecting crowds, Mr. Modi’s rally turned out to be a nightmare. A heavily bandaged Jitender Mistry had injuries in the chest, arm, chin and ear. Many victims accused the Nitish Kumar government of hatching a conspiracy. In response to a question at a press conference here, Director-General of Police Abhayanand said the police did not request cancellation of the rally when the first blast occurred. Initially as the explosions started at the Gandhi Maidan, BJP leaders on the stage tried to calm the crowds saying those were the sounds of tyres bursting and firecrackers. Elsewhere Bihar CM Nitish Kumar is quoted as saying : The serial blasts in Patna, specifically in and around Gandhi Maidan where BJP’s Hunkar rally took place on Sunday, were a blot on Bihar and a matter of grave concern not only for the state but the entire nation, said a somber-looking chief minister Nitish Kumar at a presser. There could be political differences, Kumar said, but the need of the hour is to maintain peace and unity and counter the serious challenges posed by certain elements trying to vitiate the atmosphere. The CM did not rule out the involvement of terror outfits but said it would be too early to reach a conclusion. Times of India reports : Five people were killed and 66 injured in eight bomb blasts on the day of BJP Prime Ministerial candidate Narendra Modi‘s massive rally in Patna today. Three suspects were held in connections with the blast. Meanwhile, three of the five dead were identified as – Ramnarayan Singh of Patna, Vikas Singh from Kaimur and Munna Singh from Mirganj. Thousands of people had gathered at Gandhi maidan in Patna to hear Modi speak for the first time in the state in over a decade when the blasts took place. Five people died from blast injuries and 66 others were being treated for these injuries, according to Vimal Karak, Deputy Superintendent of Patna Medical College Hospital. Eight blasts occurred on the outer periphery of the Gandhi Maidan where the rally was held, Union Home Secretary Anil Goswami told PTI in Delhi. At the rally, plumes of smoke billowed from a couple of sites even as BJP leaders, including Modi, addressed the crowd. Prime Minister Manmohan Singh condemned the blasts and appealed for calm. He spoke to Bihar Chief Minister Nitish Kumar and asked him to speedily probe the blasts and ensure that perpetrators are punished. otherwise create a “perfect setting for Modi’s launch in Bihar”. “Another blast in Patna! Strongly condemn this. Nitish should find the culprit otherwise a perfect setting for Modi’s launch in Bihar!” party general secretary Digvijaya Singh tweeted. Condemning the serial blasts in Patna, Bihar Chief Minister Nitish Kumar today said that the investigating agencies will get to the root of the blasts and bring the guilty to book. “I strongly condemn the serial blasts in Patna. Firstpost reports on a serious note of the blast : Five people were killed and 66 injured in eight bomb blasts on the day of BJP Prime Ministerial candidate Narendra Modi‘s massive rally in Patna today. Three suspects were held in connections with the blast. Meanwhile, three of the five dead were identified. Thousands of people had gathered at Gandhi maidan in Patna to hear Modi speak for the first time in the state in over a decade when the blasts took place. Five people died from blast injuries and 66 others were being treated for these injuries, according to Vimal Karak, Deputy Superintendent of Patna Medical College Hospital. Eight blasts occurred on the outer periphery of the Gandhi Maidan where the rally was held, Union Home Secretary Anil Goswami told PTI in Delhi. The first blast took place hours before the rally. A crude bomb went off in a newly constructed toilet at the Patna railway station early this morning around two kilometres from the venue of the BJP’s much publicised ‘Hunkar rally’. Sad are the ghastly killings and sad is the way of Press in reporting too.